Final Cut on Film: "Overrated..."
For all the buzz "Tucker & Dale vs. Evil" has garnered since its debut at Sundance - you'd think it was the next classic cult horror flick re: "Shaun of the Dead", but those expectations are much too lofty as 'T&DvE' (shorthand from this point on) is nothing more than an above-average "student film" that (blasphemously) may have been better serviced by handing the material to a major Hollywood studio. 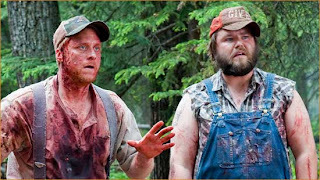 It's not like 'T&DvE' is without some level of merit - the turn-the-tables take on the "teens-tracked-down-in-the-woods" horror film formula offers some decent laughs but the movie drags - even with an 86 minute runtime. Performances are reasonably solid - especially Katrina Bowden (a dead ringer for Ben Stiller's wife), who's destined for huge things. 'T&DvE' is suitable for a midnight Cinemax viewing but shelling out 12 bucks for a ticket is more ill-advised than getting accidentally chewed up by a wood chipper.